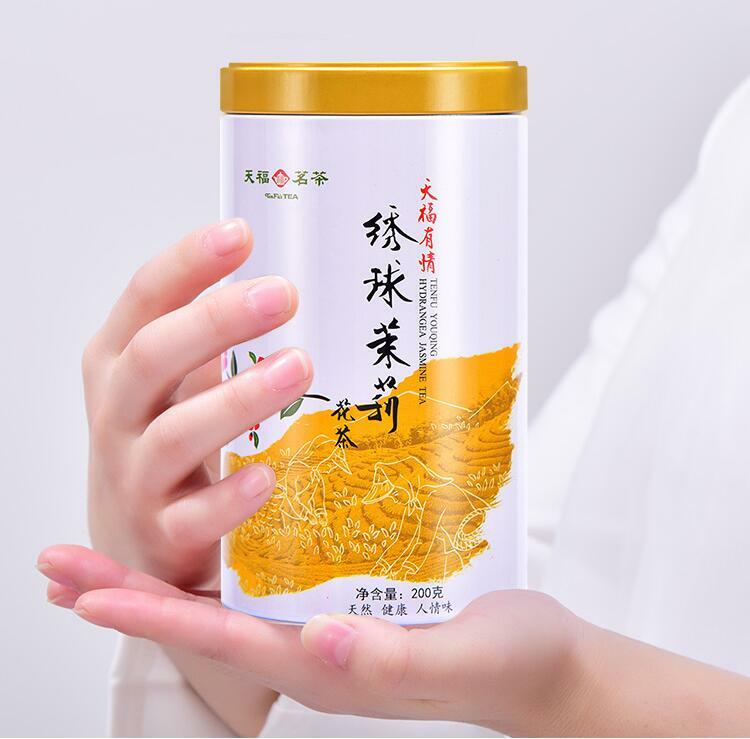 Buy Chinese famous brand Tianfu high quality Hengxian jasmine scented Dragon Pearls green tea loose leaf 200g online for sale. 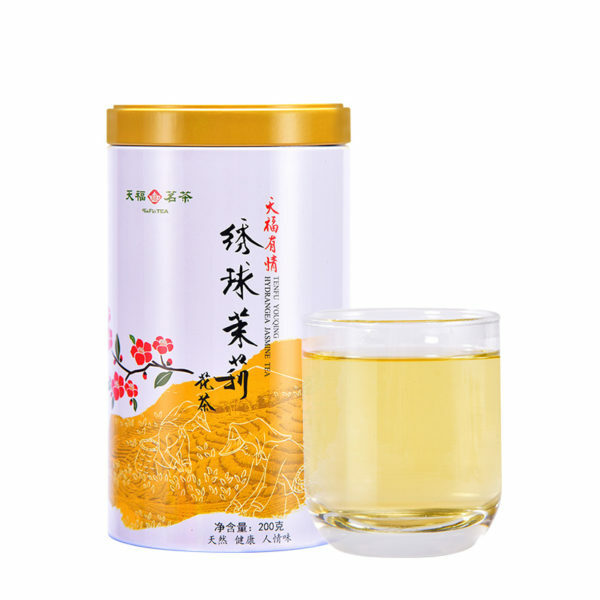 jasmine pearl tea is a small round pearl-shape green tea scented with jasmine flower with health benefits of energy boost. 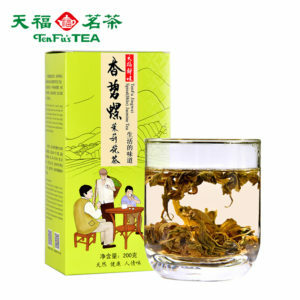 Ingredients: Full leaf China green tea scented with Hengxian jasmine blossoms. 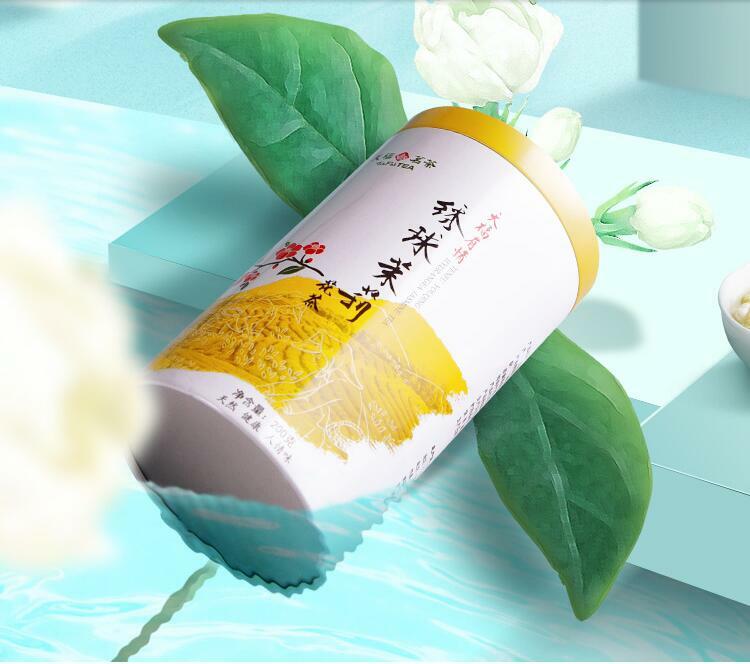 FLAVOR PROFILE: Smooth green tea flavor with a bold floral aroma. 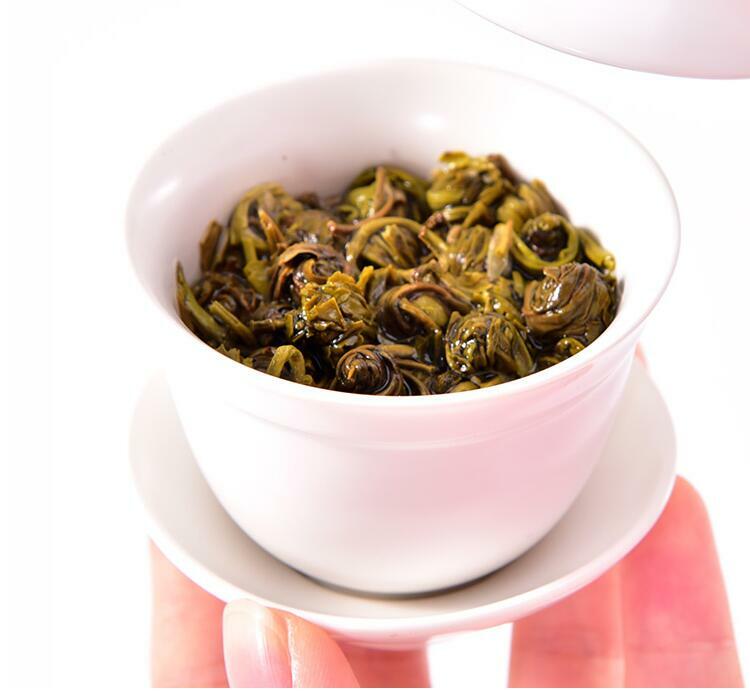 tender tea leaves, hand-rolled and deeply infused with the sweet aroma of jasmine blossoms. PROVIDES A CALM, FOCUSED ENERGY BOOST. 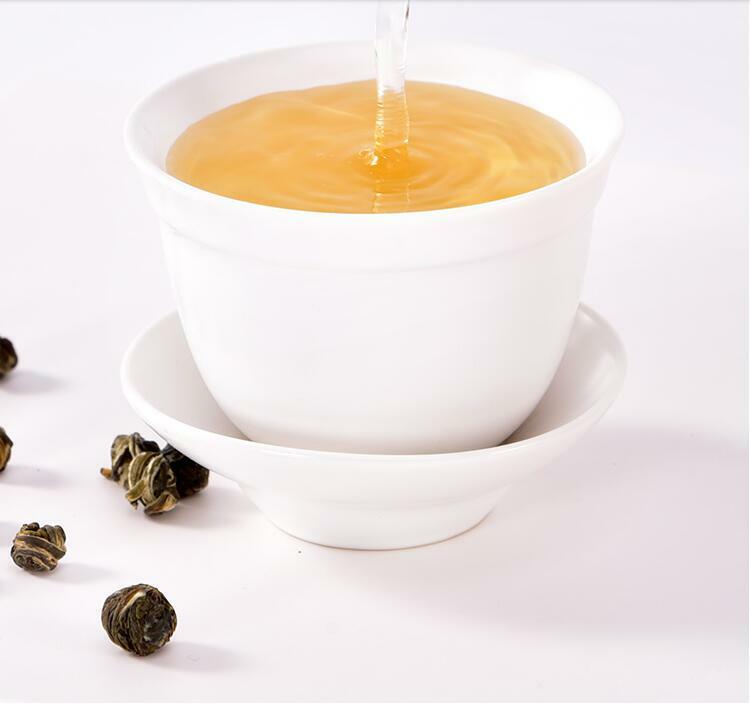 Our Jasmine Pearls Tea is made from a green tea base which contains naturally occurring levels of caffeine and L-Theanine, a combination which provides a long-lasting, calm energy boost and increased focus. HAND ROLLED PEARLS INFUSED 5X WITH ORGANIC JASMINE BLOSSOMS. 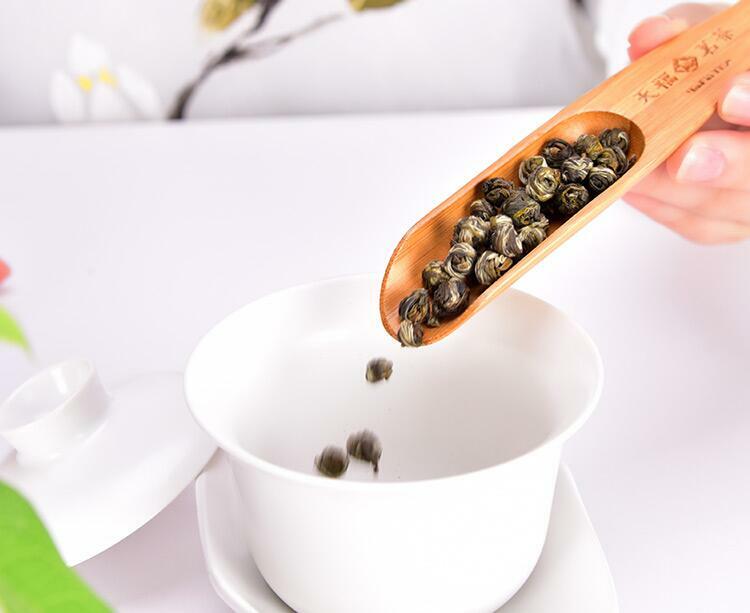 We start with the very finest organic tea leaves and infuse them with fresh organic jasmine blossoms 5 times in an authentic scenting process that takes days. The blossoms are carefully removed before the leaves are hand-rolled. BOOSTS METABOLISM. Made with green tea leaves which contain antioxidants, catechins and amino acids that can help support a healthy metabolism. 1. What’s the difference between Jasmine pearl tea and green tea? 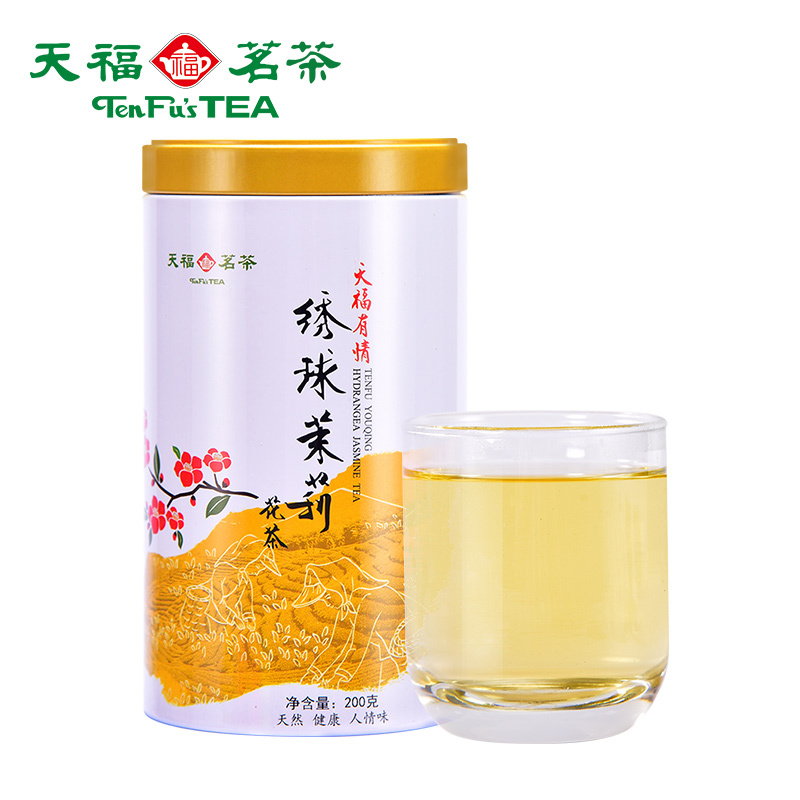 Answer: Jasmine tea is a type of green tea but it is scented with freshly-grown Jasmine flowers. 2. How do you ‘scent’ tea? 1600 pieces of flowers for one tin of jasmine pearl tea. 1) The process of making Jasmine Pearls begins by plucking only the newly sprouted spring season leaves of the tea plant. Although the top bud and two leaves are plucked along with the stem, the lower leaves are discarded and only the bud and long stem are retained. 2) Using traditional bamboo trays, the buds are withered in direct sun or over low heat to reduce moisture and make them supple and conducive to rolling. Once adequate suppleness is achieved, top bud and stem are gently twisted in between the thumb and index finger to bring the shape into that of a ‘pearl’. It takes at least 2000 pearls to make one pound of tea. 3) The rolled pearls are then heat infused with jasmine flowers five times to achieve the desired strength of aroma. 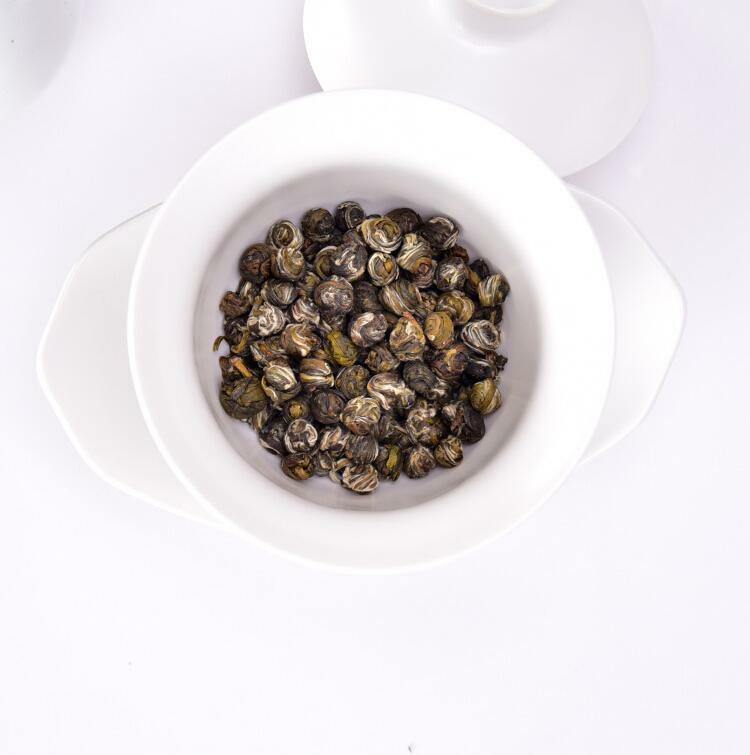 High grade Jasmine Pearls undergo this process at least five times. 4) This mixture is stored overnight, and Jasmine scent is absorbed by the tea pearls. 5) The mixture is then heated to 45°C (113°F) and cooled again. 6) This process is repeated 5 times. 7) Finally, the Jasmine flowers are sifted out and the pearls are dried a final time. 8) A lot of skill is therefore needed by Jasmine Pearl tea makers to strike a good balance between the leaf and the flowers. 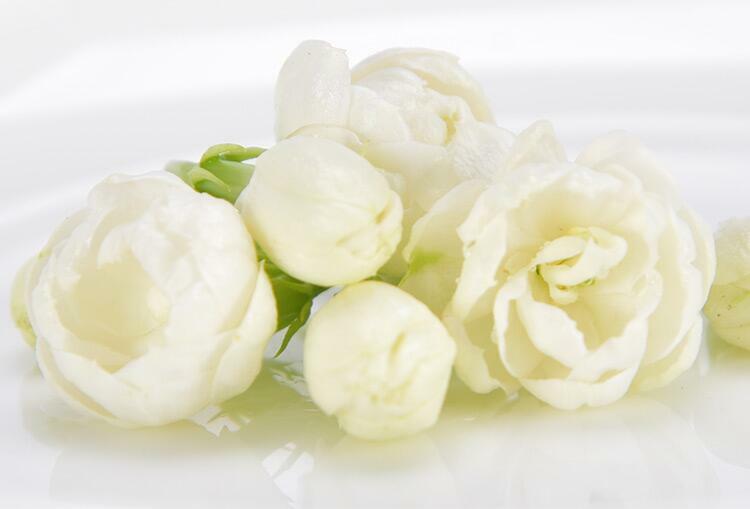 The scented pearls are carefully packaged to ensure freshness on their journey to you. 3. Is your tea GMO-free? Answer: Yes, our tea is completely GMO-free. The tea plant, Camellia sinensis, is grown without genetic modification. Rather hundreds of tea plant strains known as cultivars (“cultivated varieties”) are bred and planted through traditional botanical methods like plant hybridization. GMOs are explicitly forbidden under the USDA’s organic program, so you can rest assured that our tea is absolutely pure, organic and GMO-free. 4. What’s the origin of the tea? 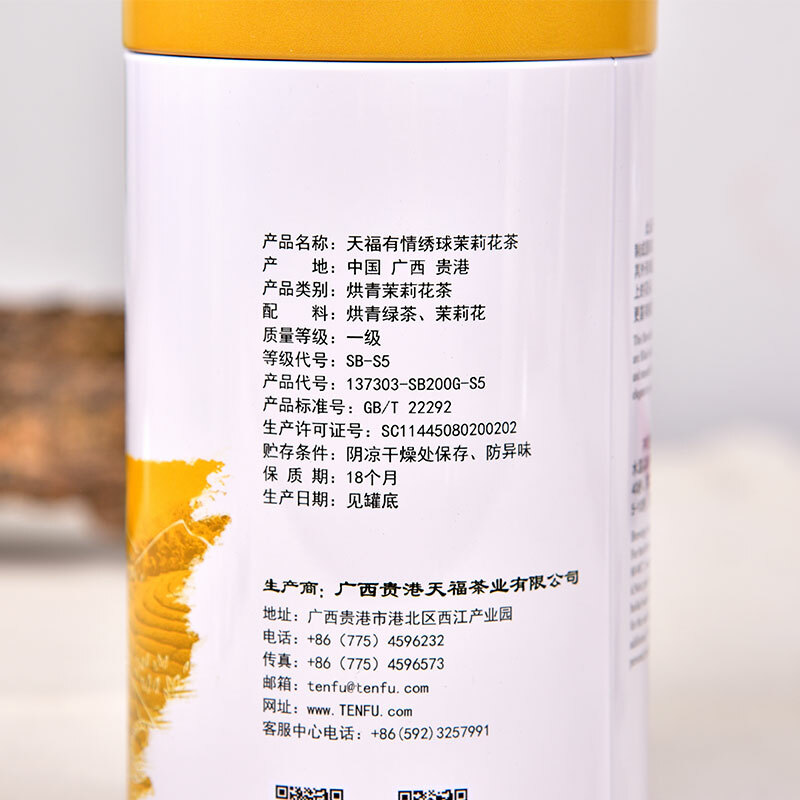 Answer: Our tea is grown on an organic farm in the Chinese province of Guangxi. 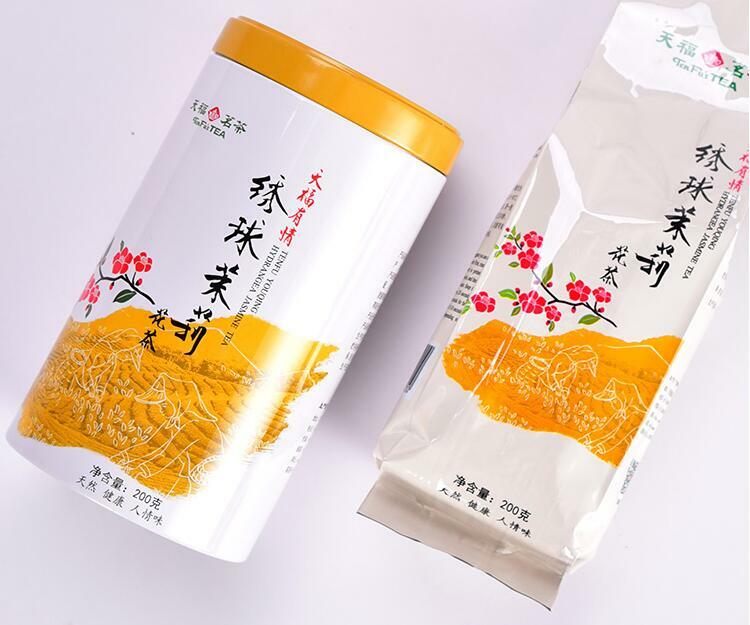 When you open the bag the dried tea has a lovely and extremely strong scent! The overall flavor is clearly jasmine and has a light floral taste with no bitterness. The jasmine fragrance is amazing and the flavor of the tea is clean and fresh. The tea is high quality, with great flavor and easily supports multiple steepings. The aroma of Jasmine is slight and pleasant. The tea tastes very refreshing. 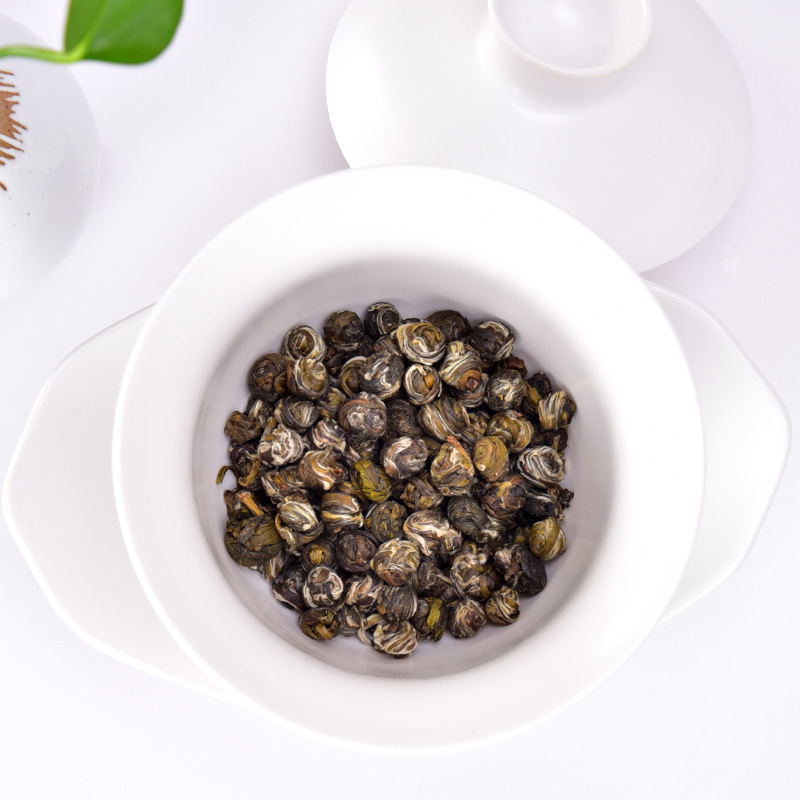 Jasmine Pearls are a fine representative of the art of handcrafted tea, requiring careful, skilled plucking and processing to achieve beautiful pearls with smooth green tea flavor and rich jasmine aroma. Steeping time may vary based on your personal taste or on how many infusions have already been done. Experiment with the brewing of your tea to discover its unique character.